If you have a short document that only has a small amount of text on the last page, you might be able to shrink it just enough to print on one page, and avoid printing the extra page. To do this, use the Shrink One Page command. 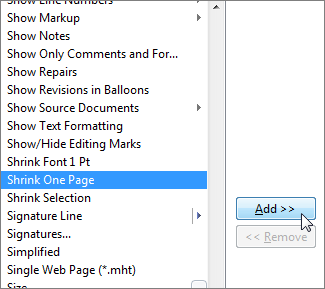 Word will attempt to shrink the document by one page by reducing the size and spacing of the text. For example, it will shrink the document above to 1 page, or it might shrink a 3-page document down to 2. Tip: Save a copy of your document before using this command. In order to shrink the document, Word decreases the font size of each font used in the document. You can undo the command by pressing Ctrl + Z. However, after you save the document and close it, there is no quick way to restore the original font size. Shrink One Page isn’t a commonly used command, so the button isn’t shown by default. You can, however, quickly add it. 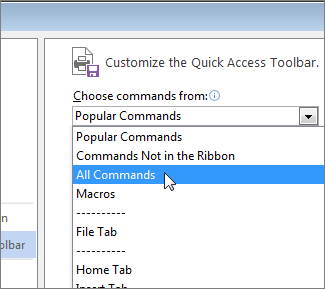 The quickest way to add the button is to add it to the Quick Access Toolbar. 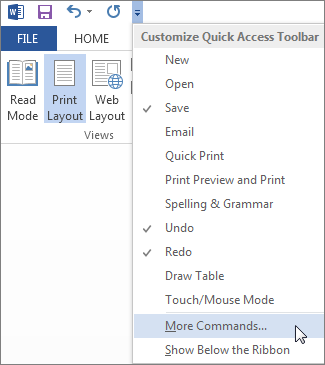 In the Quick Access toolbar at the top of the Word window, click Customize Quick Access Toolbar (the small down arrow) and choose More Commands. Under Choose commands from, click All Commands. Scroll down through the list of commands until you find Shrink One Page. Click Shrink One Page to select it, and then click the Add button. Once the button is available, just click it to shrink the text. Click Edit Document > Edit in Word Online if you haven’t done so already. Press Ctrl+A to select all the text in your document. Click Home > Shrink Font one or more times. 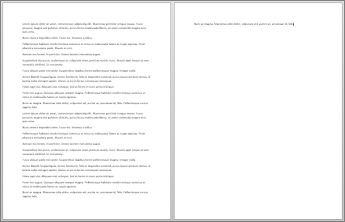 As you click Shrink Font, Word decreases the size of every font in your document. Click View > Reading View to see if you shrank the text enough. Tip: If this doesn’t work and you have the Word desktop program, click the Open in Word button to open your document in Word and shrink text to fit there.